Ana Arango Sensei is a 5th Degree Black Belt in Aikido, certified by Master Teacher Mitsugi Saotome Shihan. She has been training in Aikido since 1990. She also has a background in Karate, Physical Fitness, Hatha/Kundaliuni Yoga and Meditation. She is also a pilot and a licensed attorney in both Texas and New York. In addition, she is also certified in Traditional Chinese Medicine by the Chengdu University in China; a Doctor of Naturopathy (N.D.). and is certified by Dr. Deepak Chopra in Primordial Sound Meditation. Sensei is both a teacher of Aikido as well as a devoted dedicated student. Arango Sensei practices and studies Aikido religiously and continues to attend seminars and intensive ASU camps taught by Saotome Shihan and and other ASU Shihans. 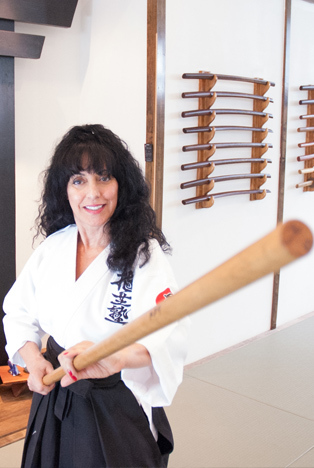 She is regularly given the honor to train at the Shihan University, the Master Teachers Training Facility in Florida where the Aiki Shrine is located. Arango Sensei is also on the ASU advisory board. Arango Sensei's philosophy incorporates elements of her diverse studies and experiences to create a unique holistic teaching approach. She believes that Body, Mind and Spirit are inseparable, and that all teaching and understanding should be based on an integrated approach of all three. Sensei loves to teach others to help themselves, to have choices in times of crisis, and to stay centered within a peaceful self. The Ueshiba Juku was awarded by Mitsugi Saotome Shihan to Sensei Arango. Mitsugi Saotome Shihan selected senior students and instructors in recognition of their loyalty and dedication into building ASU and promoting O Sensei’s vision. It declares that they are not only true deshi (direct disciple) of Saotome Sensei and inheritors of his teachings, but are also part of O Sensei’s own school and pure lineage as only a true Uchi Deshi of O Sensei can recognize. The status is indicated by a special kanji worn on the formal Gi of the authorized individual, and is an honor independent of specific rank or Shihan status. Rank | Where born? | Black Belt year(s) | How has Aikido affected your life? Rank | Where born? | Black Belt year(s) | How has Aikido affected your life?